When first arriving at a new house there are usually dozens of little bits and pieces of homeware you need to make it a home. There are bed sheets, pillows and duvet, bathroom wash kits, and kitchen utensils and cooking equipment. If you are moving into university halls, then some of this may already be there for you to use, but if you are moving into private accommodation, chances are you'll have to buy it all yourself. You can buy these from shops on most high streets in the UK, or from most supermarkets. However, it may work out cheaper and easier for you to buy them all online from a single website and get them delivered directly to you. 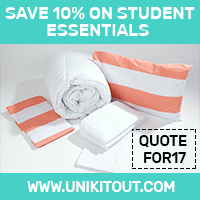 We have teamed up with UniKitOut to offer you 10% off all the student essentials on their website. They offer brilliant Combination Starter Packs, as well quality individual products at a great price, for student bedrooms, bathrooms and kitchens. 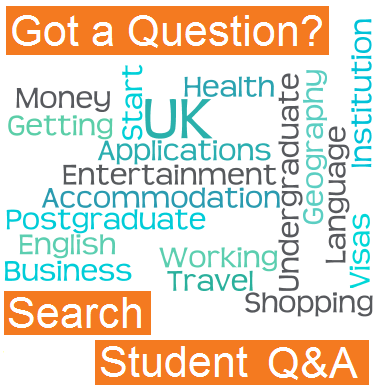 What's more, with ForeignStudents.com you can save 10% off everything on the site. Simply enter the code FOR17 at the online checkout.